Questions about why we favor go public direct over reverse merger? Contact Us for direct, personal answers. As a note to our readers: Of over the twenty Chinese companies we took public, not one was through a reverse merger. We did no transactions with Mr. Zhou or his firm. The Securities and Exchange Commission today charged a New Jersey-based consultant with violating securities laws and defrauding some investors while helping Chinese companies gain access to the U.S. capital markets. The SEC alleges that Huakang “David” Zhou and his consulting firm Warner Technology and Investment Corporation located more than 20 private companies in China to bring public in the U.S. through reverse mergers, and then committed various securities laws violations in the course of advising those companies and later assuming operational roles at some of them. After earning millions of dollars in consulting fees, Zhou and his firm have left several failed Chinese companies in their wake in the U.S. markets including China Yingxia International, whose registration was revoked after the company collapsed amid fraud allegations. The SEC has previously charged several individuals and firms with misconduct related to China Yingxia, including Zhou’s son. The SEC alleges that the elder Zhou engaged in varied misconduct ranging from non-disclosure of certain holdings and transactions to outright fraud. For instance, Zhou failed to disclose to investors in one company that he engaged in questionable wire transfers of their money to evade Chinese currency regulations, and he orchestrated an elaborate scheme to meet the requirements necessary to list a purported Chinese real estate developer on a national securities exchange. Zhou also stole $271,500 in investment proceeds from a capital raise to make mortgage payments on a million-dollar condo where his son lives in New York City. “Zhou and his firm sought to take advantage of our financial markets by propping up some Chinese issuers with the sole purpose of enriching themselves at the expense of U.S. investors,” said Andrew M. Calamari, Director of the SEC’s New York Regional Office. According to the SEC’s complaint filed in U.S. District Court for the Southern District of New York, Warner Technology and Investment Corporation advertises itself on its website as the first U.S. consulting firm that successfully brought a Chinese private company public in the U.S. through a reverse merger with an OTCBB trading company. Zhou’s misconduct occurred from at least 2007 to 2010. 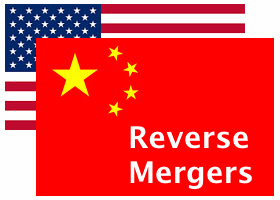 After completing the reverse mergers, Zhou strongly influenced or even directed many of his clients’ newfound U.S. presence and obligations as public companies. He opened and controlled U.S. bank accounts for many of his clients to pay for services rendered and receive any proceeds from fundraising done in the U.S. This enabled Zhou to control how and when offering proceeds were wired to China, and gave him the ability to direct money to himself purportedly to collect fees or repay loans made to the companies. The SEC alleges that Zhou engaged in manipulative trading as part of his scheme to list China HGS Real Estate on a national exchange, including matched orders to meet the $4 minimum bid required for listing. Through gifts of stock and a purportedly private sale to a broker-dealer, Zhou schemed to artificially create a sufficient number of shareholders to meet a listing requirement to have more than 400 “round lot shareholders” with 100 shares or more. The scheme succeeded, and Zhou’s client was approved for listing on the exchange. According to the SEC’s complaint, Zhou engaged in unregistered sales of securities for several clients, including a $5 million offering to roughly 85 Chinese-Americans living in several U.S. states. Zhou and his firm also improperly assisted with securities offerings for two clients while not registered as broker-dealers, and they aided and abetted violations by other unregistered brokers. The SEC’s complaint against Zhou and Warner Technology and Investment Corporation alleges violations of Sections 5(a), 5(c), and 17(a) of the Securities Act of 1933, Sections 10(b), 13(d), 15(a), and 16(a) of the Securities Exchange Act of 1934, and Rules 10b-5, 13d-1, 13d-2, and 16a-3. The SEC’s complaint further charges Zhou for control person liability and aiding and abetting violations of Section 10(b) and 15(a) of the Exchange Act, and Rule 10b-5(b).